PWMinder is a cross-platform, Password manager application that is used to store all of your passwords and other sensitive data in a secure encrypted file. With PWMinder, you don't need to try and Remember ALL of your various passwords, but rather create one very secure password, to be able access all of your other passwords in one place. PWMinder also allows you to automatically log in to your favourite websites and allows you to export data. 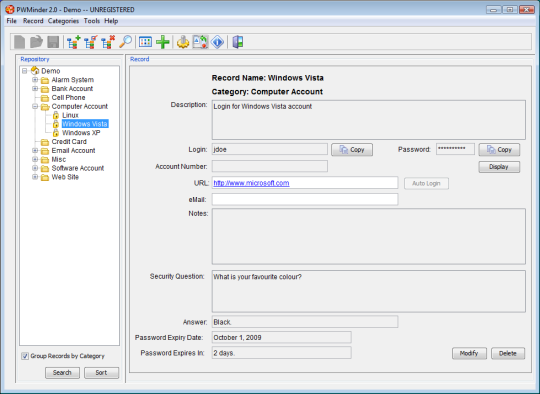 ...... PWMinder also include a configurable Password Generator Tool, which allow you to create secure passwords. * Passwords are stored in Repository files. You can have as many Repositories as you want, e.g. one for home passwords, one for work passwords, one for each person in you family, etc. * Since each Repository is a file on your computer, it is easy to transfer Repositories from one computer to another, to store them on a memory stick, back them up, etc. * In addition to storing a login and password, each record can also store an account number, url, email address, notes and more. * URLs and Email fields in the record, are hyper-linked and can open your browser or email client. * Each password record can have an expiry date set for it, to remind you to change the password. Qweas is providing links to PWMinder 2.6.4 as a courtesy, and makes no representations regarding PWMinder or any other applications or any information related thereto. Any questions, complaints or claims regarding this application PWMinder 2.6.4 must be directed to the appropriate software vendor. You may click the publisher link of PWMinder on the top of this page to get more details about the vendor.